How long you stay married to your partner could be linked to your genes, a new study suggests. While people fall in love for a variety of reasons, the length of time you stay with your spouse may depend on the version of the gene responsible for producing oxytocin – dubbed the ‘love hormone’. Experts found that if at least one partner had a specific variant within the oxytocin gene receptor, the couple had a greater chance of marital bliss. Oxytocin is a hormone that plays a role in social bonding and plays a significant role in social processes such as bonding, building trust and nurturing relationships. The study, led by Yale School of Public Health researchers, examined 178 married couples ranging in age from 37 to 90 years old. Those who carried the GG genotype within the oxytocin gene receptor reported feelings of security within their marriage compared with other couples who had different genotypes. 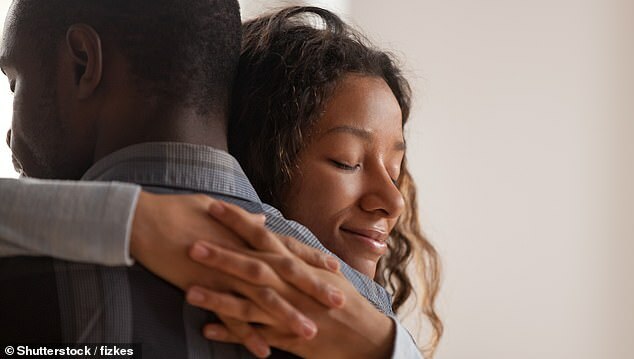 ‘This study shows that how we feel in our close relationships is influenced by more than just our shared experiences with our partners over time,’ said Lead author Joan Monin, associate professor at Yale University, who conducted the study. The researchers also found that people with the GG genotype reported less anxious attachment in their marriage. Professor Monin said that anxious attachment is a style of relationship insecurity that develops from past experiences, and is associated with diminished self-worth, high rejection sensitivity, and approval-seeking behaviour. The researchers said that an individual’s GG genotype and their partner’s GG genotype together account for about 4 per cent of the variance of marital satisfaction. Although this percentage is small, it is a significant influence considering other genetic and environmental factors to which couples are exposed. The study findings may lead to future studies to examine how couples’ genotypes interact to influence relationship outcomes over time. WHAT IS THE ‘CUDDLE HORMONE’ OXYTOCIN?